That rather anonymous strip of land on George Street North, under the shadow of the Cahill Expressway and adjoining the Museum of Contemporary Art, is traversed by thousands of pedestrians each day. But in the early 19th century, it was a solid row of shops and houses, Sydney’s original town centre, and home to the prosperous merchants of Governor Macquarie’s Sydney. Figure 2 George St 1829, with notations. SHFA. Wollstonecraft and Berry’s building is the three story house in the centre of the image. Prominent among them were business partners Edward Wollstonecraft and Alexander Berry. 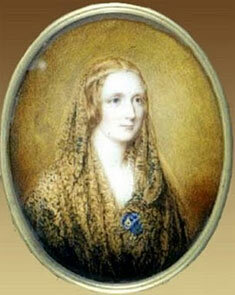 Wollstonecraft’s sister, Elizabeth, was also married to Berry. But the Wollstonecrafts were also related to some of the most prominent names in British history. 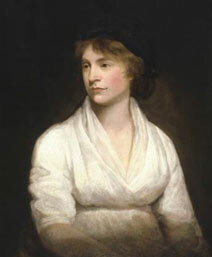 In fact, some accounts suggest that Edward Wollstonecraft had left England to escape the notoriety of his relations. 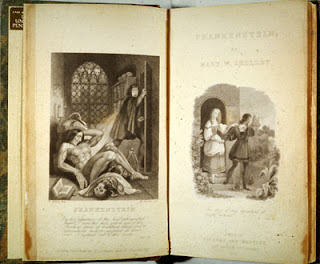 His aunt was the renowned early feminist, and author of A Vindication of the Rights of Woman, Mary Wollstonecraft. Her daughter, also Mary (who was the author of the famous novel Frankenstein), married the revolutionary poet, Percy Bysshe Shelley. Their unconventional lives scandalised Britain, and Edward’s nomadic life as a trader perhaps allowed him to escape the family’s notoriety. On Mary Shelly’s death in 1851, a lock of her hair was sent to Alexander Berry as a keepsake, it is now held by the Mitchell Library. It was on a voyage from Lisbon in 1812 that Wollstonecraft – a “tall, formal-looking young man, dressed in black” – was introduced to Alexander Berry, and the pair became friends and business partners. They shared lodgings in London with Elizabeth Wollstonecraft until 1819 when all three set sail for NSW. There, both Wollstonecraft and Berry received a series of land grants. By 1825, Wollstonecraft had been confirmed as owner of 500 acres (202 ha) on the northern side of the harbour, which he named ‘Crow’s Nest’, in the area now known by his family name. But he preferred, it seems, to live “above the shop” in The Rocks. His combined home-warehouse was one of a row of shops and houses where First Fleet Park is now located, virtually under the Cahill Expressway. By all accounts, Wollstonecraft was a rather solemn and driven man. Even Berry, his friend and partner, would say after his death that his behaviour towards the end of his life was “such as to render my existence hardly tolerable”. Figure 6. George St in 1847 (detail). 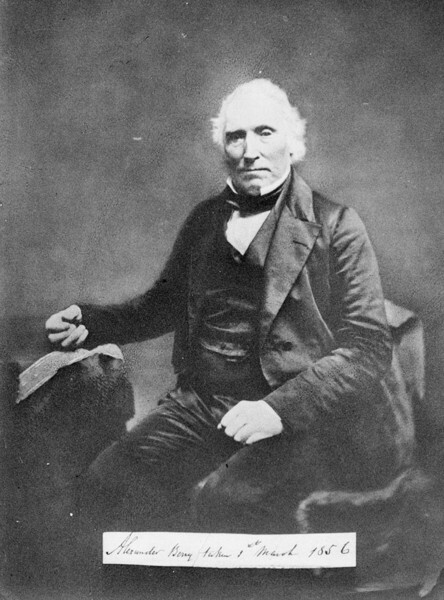 Capt Owen Stanley. Mitchell Library. Wollstonecraft lived in the three story building at the centre of the image. In The Rocks, his neighbours were other merchants like the former convict and wealthy businesswoman Mary Reibey and Anna Maria Bunn, who would write, in the 1830s, Australia’s first novel, The Guardian: A Tale by an Australian. The offices of the Sydney Gazette were nearby, as was the post office. Figure 7. George St 1848. Fowles. The Australian Hotel, had been the 1st Post Office in 1809, Wollstonecraft’s townhouse and offices stands out above its neighbours, the last building on the right was the Sydney Gazette offices from 1803-1842. It was a handy location for the local merchants, whose houses backed right on to Sydney Cove, allowing their ships to be unloaded almost directly into the warehouses. Without exception, the houses all turned their backs on the harbour that today would guarantee them multi-million dollar prices. Figure 8. Lower George St. 1889. SHFA. Wollstonecraft’s building is the tallest on the left. It seems that Edward was the ‘stay-at-home’ partner in the business, while the more energetic and restless Berry traded in the South Seas and to Britain. In the 1820s, under Governor Brisbane, the two were granted a further 10,000 acres (4047 ha) on the Shoalhaven River, called Coolangatta, a site favoured by Berry who created access to the sea by carving out a canal. Wollstonecraft, meanwhile, was involved in a proposal to cut a road through The Rocks to Millers Point, a project which, a decade or more later, became the Argyle Cut. He had risen to prominence in the Sydney business community, being appointed a magistrate, a director of the Bank of NSW and the Bank of Australia, and chairman of the Chamber of Commerce. But he died, aged only 49, in 1832. He had never married, so Berry and his wife, Elizabeth, returned to Sydney from the South Coast where they lived at Wollstonecraft’s Crows Nest estate. They too remained childless and although Elizabeth died in 1845, Alexander Berry – also a magistrate and member of the Legislative Council – lived until September 1873. Today his name lives on in the pretty south coast town of Berry, close to his Coolangatta estate, and a long way from The Rocks.